Well, like everyone else (or so it seems), I am determined to eat healthier in 2013...at least for January:) Of course that means adding more veggies to my diet! You too? Well, I'm here to help you out. Broccoli anyone? I hope you like it as much as I do. This crop of broccoli didn't come from the garden, but straight from the kitchen~from scratch, no less! My sister bought me this Olympic rings cookie cutter for the 2012 Summer Olympics, but sadly I never got around to making any cookies with it. 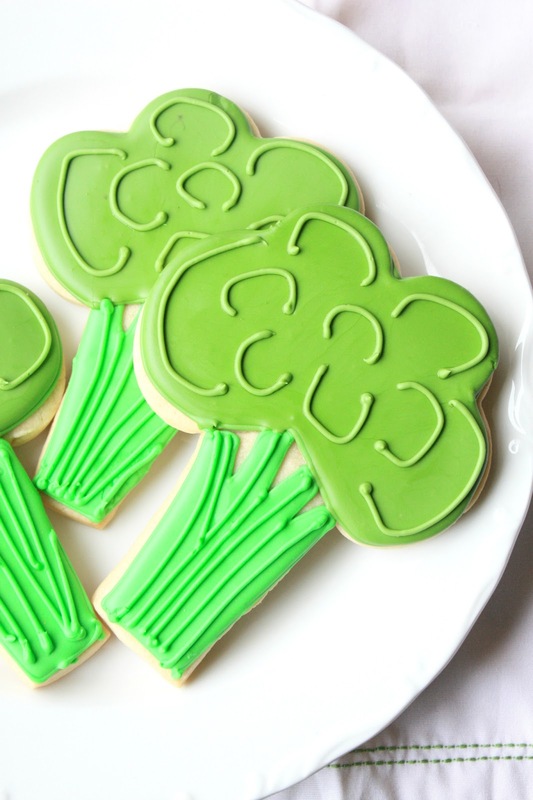 Skip forward to today and I put this cutter to good use as broccoli cookies! I merely cut out the middle, bottom ring section and placed a broccoli stalk in its place (cut out from the cookie dough freehand, with a small, sharp knife). Use an Olympic rings or cloud cookie cutter to make the head of the broccoli. Cut broccoli stalks from the cookie dough and place them flush to the bottoms of the broccoli heads. Bake cookies at 350 degrees from 15-18 minutes or until they start to brown slightly on the edges. Make royal icing of thicker consistency for the outline. Add leaf green to a portion of the royal icing and mix well. With a #3 tip, outline the stalks. Let dry for about 15 minutes and fill the stalks with a thinner, "fill" consistency of royal icing with the #3 tip. Let dry for about 15 minutes and then add the details with the #3 tip and the thicker consistency. till it is a shade of your liking. With a thicker consistency, outline the broccoli heads with the darker icing and a #3 tip. Let the heads dry for about 15 minutes and then with a thinner, "fill" consistency of the darker green royal icing, and a #5 tip, fill the heads. Let them dry for about 15 minutes. With a thicker consistency, add the swirls with a #3 tip, and then add the royal icing dots to the heads with a #3 tip. Cool! 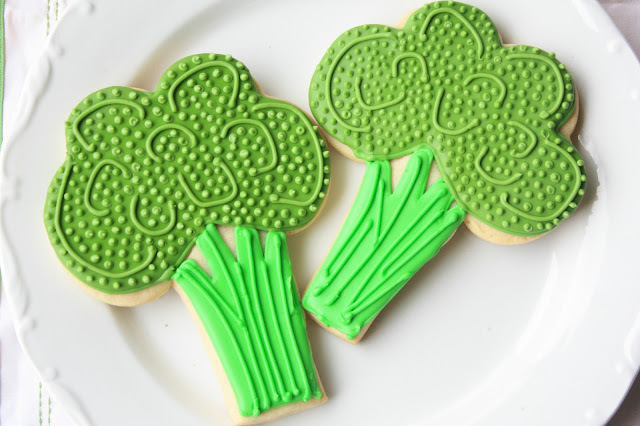 I love your broccoli cookies! Now, if only we could inject them with all the goodness of broccoli we could live on the cookies alone! These turned out fantastic!! Great idea to make dots- it really makes them broccoli-like!! So cute and fun! You're always so clever! heheh omg this is so cute, Sue! The cutouts make great trees too!!! LOVE these, Sue! So uber creative :) But, I would expect nothing less from you!! I love veggies anyway, but I would definitely eat more of them if they tasted like cookies. These are so creative! Even George W. Bush would eat this broccoli. I happen to love broccoli and I could sure come to like these. So cute. Hehe, broccoli in cookie form has to be the best form of broccoli! Although I do actually like broccoli and all the veggies anyway. These are so detailed. Again, you have talent girl... I'm envious. And your photography is awesome too. So cute, love the hue of the green! Ha, these are some veggies I'd eat with pleasure! This may be my favorite broccoli ever! These are adorable! All four of my kids actually like broccoli. I have no clue how that happened as I will only eat the stuff if smothered in Ranch dip, but these cute cookies... well, I could eat plenty of them. If only they had the same nutritional value as the real stuff. Oh, well. These are the cutest things I have seen! I don't think my Dr would agree, but this might encourage more kids to try more veggies if we promised them one of these afterwards. Precious. Oh! So cute :) The dots were a great idea. Oh how funny - last night I was trying to make my brocoli taste good - if I had only known this trick! So cute! These are the cutest cookies ever, Sue! How fun! My kids would love these! You did such a great job. Sue, you are so smart! I am now ready to go on the all-broccoli-all-the-time diet. This is about the only way you could get me to eat broccoli! I love your new blog look Sue!!! These are so adorable! You just amaze me on your decorating skills...wish you lived closer by to teach me. Happy weekend. If only broccoli tasted so good! Awesomely creative and perfectly executed as usual! Great instructions too. Love it! So cute! I know I wouldn't have a problem getting my 15 year old to eat these vegetables! Oh my goodness - those are the cutest cookies, ever! These are completely brilliant... not to mention utterly adorable!! For sure, my son wouldn't reject these broccoli. These cookies are so cute! All the kids will love these broccoli! Yes, finally broccoli that I would enjoy! Love these.